Join us for a traditional, delicious, turkey dinner with all of the fixings. 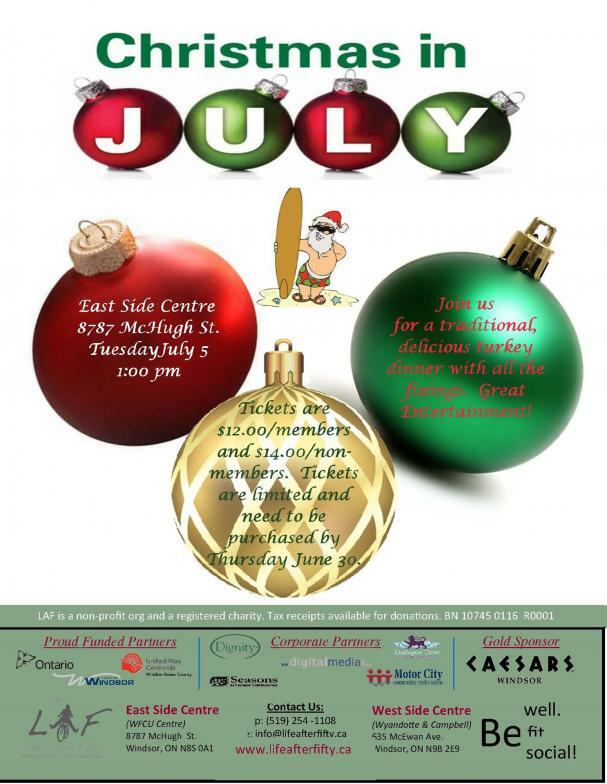 Great entertainment and door prizes! We will be showing “The Pink Panther”, a comedy from 1963 starring Peter Sellers and David Niven. LAF & OWE take part in Open Streets Windsor! On Sunday July 17th from 9:00am-1:00pm, the City of Windsor will be closing traffic and opening some of its streets to residents from across Windsor-Essex. This event encourages active transportation and healthy living. It also gives residents an opportunity to admire improved streetscapes and get to know local businesses and community organizations. Join us for the largest free recreation program in the city’s history! On July 17th 2016, from 9am-1pm, designated streets in the City of Windsor will be closed to traffic and open to everyone in the community to enjoy. Open Streets is a unique event that has been held in over 100 cities in North America. It allows people to use the streets for a host of healthy and fun physical activities like walking, cycling, yoga, dancing, and fitness. It also showcases the rich history and culture of the City of Windsor through walking tours, biking tours, food, and arts activities. Make sure to come out and support Life After Fifty as we take part in this fun and exciting event. This month’s beading project is a pretty Kumihimo bracelet.